Minneapolis. Graywolf Press. 2017. 256 pages. 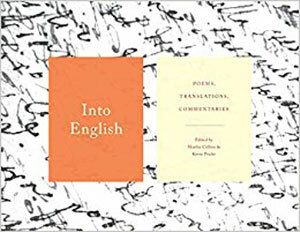 The publication of Into English will soon be considered a watershed moment in the study of literary translation; indeed, the fact that such a book didn’t exist until now proves the increasingly antiquated idea that literary translation is considered a lesser art than the composition of poetry itself. In the anthology, Martha Collins and Kevin Prufer present twenty-five poems, each translated by three different translators, in a wide-format presentation that allows all three translations to appear side by side, followed by a brief commentary. 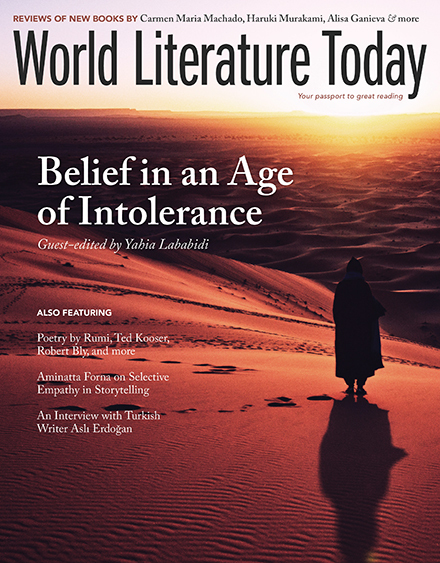 Practicing translators like Willis Barnstone, Kareem James Abu-Zeid, and Karen Emmerich discuss word choice, tone, and how each translator addresses particularly difficult decisions. 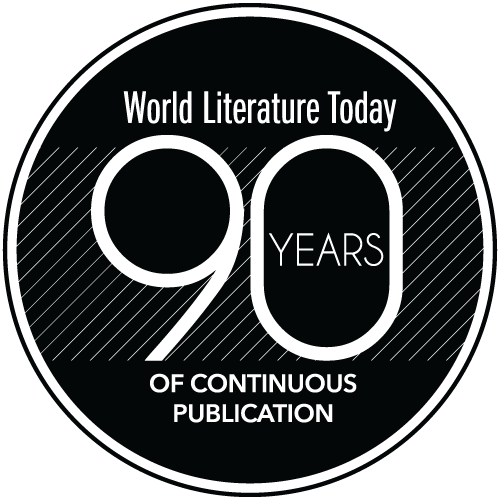 Because the editors’ rubric for selection required that each translation be previously published, the selection of poems—which includes work from a wide temporal range but features multiple contributions from languages like Mandarin, Russian, and Spanish—is somewhat circumscribed in terms of both gender identity and language, a limitation that Collins acknowledges and addresses in her introduction to the book. When I say I, I mean he and she. When I say and she, I mean you. The moment when I say she, it is you. Other standout chapters include Arthur Sze’s commentary on a poem he calls “Returning to Fields and Gardens (I)” in his own translation, which commentators were permitted to reference in their notes, by Tao Qian (365–427 ce) and translated here by James Hightower in 1970, Stephen Owen in 1996, and David Hinton in 2008; and Alexis Levitin’s commentary on Sophia de Mello Breyner Andresen’s 1972 poem “A Pequena Praça,” translated by Ruth Fainlight in 1988, Lisa Sapinkopf in 1993, Richard Zenith in 1997, and Levitin himself in 1983. The closest comparison to Into English, which Collins mentions in her introduction, is Eliot Weinberger’s Nineteen Ways of Looking at Wang Wei, which was reissued in an expanded edition this year by New Directions with additional translations of the single poem by Wang Wei that Weinberger analyzes. Into English, like that book, does an excellent job of correcting the primary fallacy of the uninformed translation critic, the literalist—something of a misnomer—who believes in the idea of “accuracy.” Such a fallacy judges translation exclusively on the basis of semantic reciprocity, as if literature were a strictly content-based art, and that, in the case of poetry, semantic meaning should be given precedence over form, meter, and even sound. As Levitin writes in his commentary, “Flaubert was wrong when he spoke of ‘le mot juste.’ The very nature of reality and language precludes such a thing. As all translators realize, we search for le mot juste, knowing we must settle for something that merely approaches it. Even at our luckiest, what we have is perhaps un mot juste, but never the Platonic le.” Into English, with its twenty-five case studies, proves him right but also demonstrates that the pursuit of un mot juste is not just worthwhile but necessary. Bae Suah. Trans. Deborah Smith.